Hey, Israel Tried to Land on the Moon! Update: Well, looks like we celebrated too early. Israeli spacecraft Beresheet made it to the moon and even took a selfie… but unfortunately, it then crashed on its surface. We will leave this article up as a reminder of the joy that could’ve been, and not to count our spacecrafts before they landed. RIP Beresheet. Have you heard the good word? Israel is about to make its first moon-landing! I’m personally very excited for this — in fact, some might say I’m over the moon (ba-dum-dum). A very cute little unmanned spacecraft named Beresheet (which literally means “in the beginning” and is the Hebrew name for Genesis) — which is just 5 feet tall but weighs a whopping 1300 pounds — is set to land on the moon’s surface on this afternoon. This will make Israel the fourth-ever nation to make it to the celestial body. Beresheet was created by SpaceIL, an Israeli not-for-profit organization with a budget of $100 million, which, as my colleague Ben Sales at the Jewish Telegraphic Agency, recently noted, is a pittance by space mission standards. Beresheet launched into space back on February 21 with the help of a rocket from Elon Musk’s Space-X. The adorable spacecraft, which successfully entered the moon’s orbit in what was the hardest part of its journey, is meant to land on the moon on April 11 around 3 p.m. EDT. Onboard the lunar lander is a time capsule with the entire Bible printed in microscopic text on a coin, as well as drawings by Israeli kids (awwww). 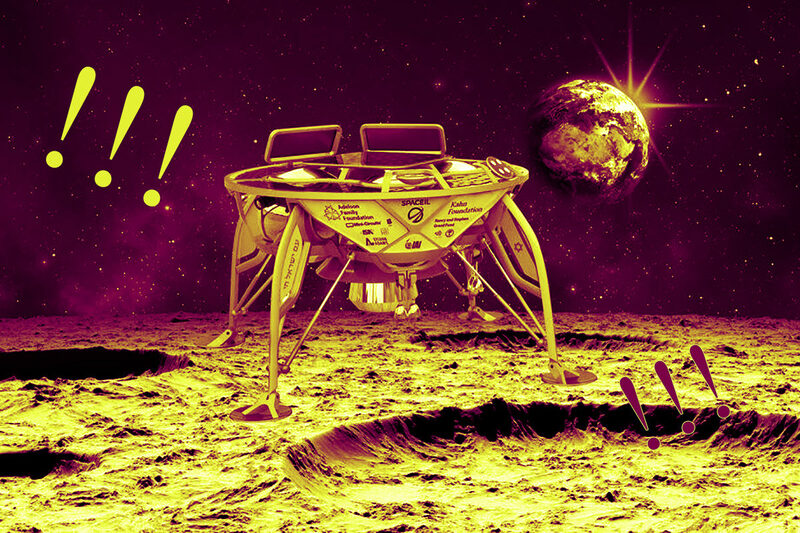 Once Beresheet lands on the moon, it will take some exploratory photos and a selfie (DUH, IT’S 2019!). The spacecraft will also test the moon’s magnetic field, as part of a joint mission from NASA and Israel’s Weizmann Institute of Science. With the help of Beresheet’s success, SpaceIL is also hoping to inspire Israeli kids to go into science and engineering. According to JTA, “its educational programs have already reached a million children.” (Now that’s a mission we can definitely get behind! You can watch the live landing below — along with thousands of overjoyed Israelis — and hopefully rewatch it many times in the following days, like me. While you’re at it, you can listen to this fun space themed Israeli playlist created by SpaceIL to celebrate here. SO EXCITING!